“A great man who has changed the lives of many is coming to the Stathakion,” said Michael Christodoulou, President of the Mytilene Society. “We must all come to this unforgettable lecture.” The excitement spread across Astoria and the New York Metropolitan area. Christos Papoutsy has made his mark on the international community. He is a unique person, inspired by his wife, Mary, a classics professor. He is preserving his Byzantine heritage and the lost civilization of Greek Ionia in Asia Minor. On May 15th, Saturday evening, at the Stathakion Culture Center, over three hundred persons attended. 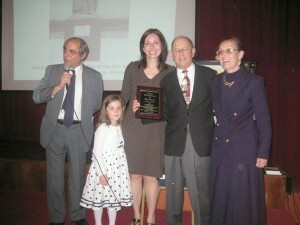 Mr. Christos Papoutsy (4th from left) presented with an award from his village of Vatousa, Mytilene, as Michael Christodoulou (left to right), President of Mytilenean Society, Elizabeth Kamviselis Verwoert and her daughter Sophia and Mary Papoutsy look on. Christos Papoutsy said” Turkey did not have a navy. Fifty Greek ships escorted by six American Naval Cruisers went into Smyrna for the refugee evacuation. This was a major risk to Greek National Security. If the Turks were able to acquire the ships, they would have had the means to invade Greece and get the Greek islands.” The Greek mercantile fleet played a major role in the export and import life of the Ottoman Turks. The annihilation of its Greek population removed it as a player in the international mercantile community. “We heard that the Japanese saved Greeks in Smyrna,” said Papoutsy. “We wanted to find out which Japanese so we could honor them. Our documentation indicates the opposite, showing a non-existence of a Japanese presence and Japanese support of Turkish policy. The loss of Smyrna and infamous exodus of Ionian Greeks from their homeland is explained in Ships of Mercy. It is the only book with primary sources on this subject. The Great Depression of the 30’s and WWII eclipsed this disaster.” Mary Papoutsy recited a moving poem called “Fire” showing the martyrdom of the Queen City Smyrna. In my opinion, the first Greek Exodus in 1914 and the 1922 Catastrophe is not discussed because it hurts too much. We lost our civilization. Who wants to remember a time that is painful? We think positive, move on and rebuild from the ashes, remembering our roots. The author has acknowledged the assistance of Mary Papoutsy in the writing of “Ships of Mercy”. “I have a living room piled to the ceiling with Captains’ logs and documents detailing the days surrounding the evacuation of Smyrna,” he said. His smile, love of the Greek language in simple phrases, communicated warmth seldom seen in a presentation of this tragic era. Mary Papoutsy conversed in fluent Greek, mingling with persons of all ages with grace and humility. Mary Papoutsy is a former Classics instructor at Rutgers University and the University of Maine. She has also founded the Hellenic Historical and Genealogical Association which promotes interest in Hellenic ancestry, offers support for genealogical research, and conducts free lectures and workshops throughout the nation on Hellenic genealogy. “Rev. Alexander Karloutsos of Southampton is the only priest who said a prayer in memory of those lost at one of our lectures,” said Mary Papoutsy. The late Rev. Michael Karloutsos, his father, was from Smyrna, of Ionian Greek descent. “Humanity has no ethnic favorites or political affiliations,” said Roger Jennings, grandson of Asa K. Jennings, who saved the Greeks of Smyrna and hero of Christos Papoutsis book. “Asa K. Jennings worked for humanity by avoiding prejudice and politics. He was able to secure an agreement from Mustapha Kemal to allow the Greeks, Armenians and Jews to leave Turkey peacefully. He secured 55 Greek ships to remove these refugees despite the fears of the Greek Prime Minister. He and his Cabinet feared the Turks would capture the ships and invade the Greek islands. Asa’s success with the Greek government was made possible by Captain Ioannis Theofanides of the battleship Kilkis. He is a true Greek hero who is unknown today by the Greek people.” Christos Papoutsy is to be commended for discovering this American hero and explains his mission. Roger Jennings stated “Asa was then appointed as the diplomat representing Greece and Turkey at the Treaty of Lausanne for the repatriation of POW’s. Asa is the highest decorated person in Modern Greek history with the Medal of Military Merit and the Golden Cross of St. Xavier (religious). The Patriarch credited Asa with saving 1,250,000 Christians in 1922-23.” Asa Jennings was a YMCA employee with a double curvature of the spine, suffering from the effects of Tuberculosis. For more information, contact rjenningsmfgco@yahoo.com. Christos Papoutsy showed Mytilene is a unique island that welcomed their refugee neighbors ten miles away from Aivali, Smyrna, Tseme and the coast of Asia Minor. My grandmothers, Despina Gagas Pappas and Catherine Tsounis were born on an island seven miles from Mytilene: the lost island of Mosconisi. The1898 baptismal certificate of Despina is on a letterhead that states “The Holy Archdiocese of Mosconisi”. The island had a significant Greek population to have its own Greek Archdiocese documents. “There was constant movement with Mytilene, Limnos, Mosconisi, the cities of Asia Minor by the maritime community,” explained Mr. Papoutsy. “The Greek middle class maritime community would follow trade opportunities having homes in different areas, bringing economic opportunities to their families. Free movement between the islands and Asia Minor was common.” “There is a ferry from Mytilene that goes to Mosconisi,” said Elaine Papantinas of Delaware whose Mother was from Mosconisi. “We made the trip with cousins. We walked through Sts.Taxiarchi’s church in Mosconisi. We visited the remains of that church. Oh, the feeling I had in there, I could almost see the beauty and elegance it had in its day.” The statue of the Mikrasiatic Mother with her three children clinging to her at Mytilene’s harbor evokes the real misery of uprooting. Cypriots from Kyrenia and Ammochostos (Famagusta) understand. Christos Papoutsy’s lectures are important. They are inspiring the new generation to think, explore and remember. “I am moved by the icons of the 1821 Greek Revolution in the Stathakion,” said Koula Sophianou, Consul General of Cyprus, at the Papoutsy lecture. “Mytilene and Cyprus had similar fates. In 1821, Cyprus and Mytilene attempted to rebel and gain their freedom. In 1974, three Mytilineous gave their life during the Turkish invasion of Cyprus. My family immigrated to Cyprus in 1922 from Constantinople. We must be united as Hellenes. Cyprus needs a strong Greece to support us.” Evangelos Kyriakopoulos, Consul of Greece added “Ships of Mercy describes a time period that is undiscussed. It is a real tragedy that must be studied.” Another youth took a photo of the oil painting “The Destruction of Smyrna, 1922” from the Pinakothiki (National Art Gallery) in Athens. She posted on her face book album. This is the legacy of Christos and Mary Papoutsy. I am a Greek-Canadian who immigrated to Canada at the age of six. I have spent the greater part of my life in Canada, a country which I love. Regrettably,over the years, I gradually became detached from the Greek community in my city, especially after the passing of my parents. However, I still feel very passionate about Greece, Greeks, Hellenic history, and current issues. I remain in my heart and soul,an Ellinida. I accidentally found this article in the Greek News website while catching up on my Greek current events. I have some knowledge of the tragedy that happened in Smyrna at the hands of the merciless ruthless, and destructive Turks. I send my deepest gratitude to Christos Papoutsy whose 10 year plus research and scholarship culminated in the publication of “Ships of Mercy.” This catastrophic episode in Greek history must become well known, especially in the western world, through the various media. We need to learn about and honour the heroes of mercy. I hope there will be a documentary or film based on “Ships of Mercy” in the future. Can you pls tell me if “ships of mercy” can be bought here in the u.k.